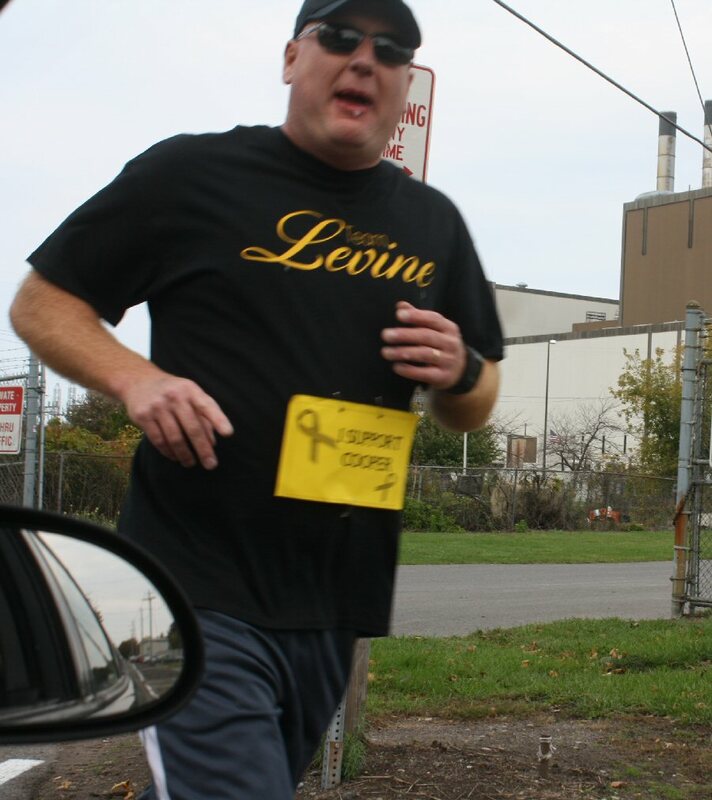 OSWEGO, NY – Recently, Oswego residents joined forces to bike, walk, and run the Team Levine Event supporting Cooper Levine, an 18-year-old freshman at Ithaca College recently diagnosed with ALL, Acute Lymphoblastic Leukemia. A donation to the family was the fee to register. 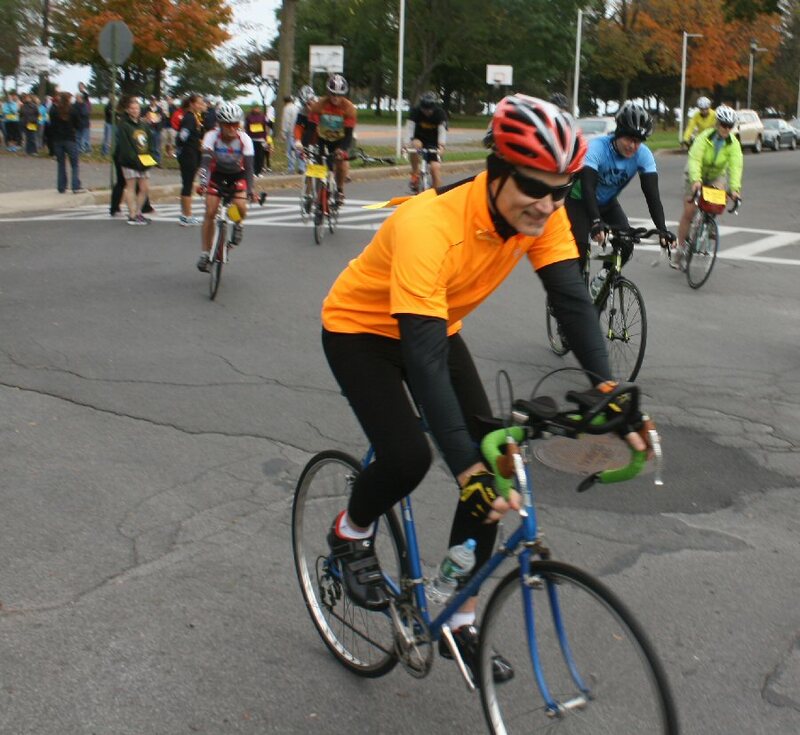 Held at Oswego’s Breitbeck Park and hosted by Team Levine Committee Standing United For Cooper, bikers rode the Oswego Tri-Sprint 10-mile course through Oswego State University’s campus and along the beautiful Lake Ontario shoreline. Runners and walkers traveled the Oswego Tri-Run/Walk 5K course turning around at the at SUNY Oswego Health Center. 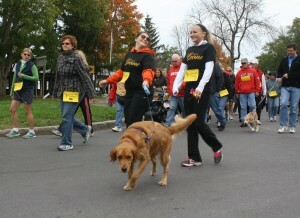 Some were accompanied by their baby strollers and many by their four-legged furry friends. 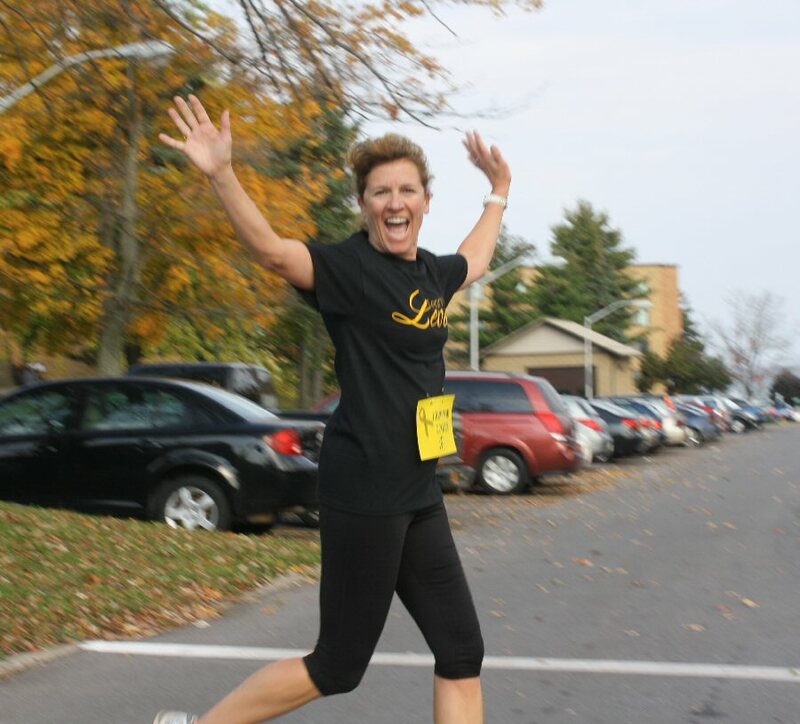 This family-friendly event was also enjoyable for the spectators cheering them on to be finishers! Black T-shirts with Team Levine written in gold, designed by Zink Shirts, were purchased as a donation and donned by the participants. As well, gold and orange ribbons, colors of the disease, were purchased and worn. They were made by and donated by Helen Kemper. Competitors were provided with yellow signs to pin to their shirts of I Run For Cooper, I Bike For Cooper, I Walk For Cooper, or I Support Cooper, in a strong show of support for the beloved teen. They were designed by FitzGibbons employee Amanda Sawyer. The participants were treated to snacks, bagels, apples, and water at the finish line donated by area businesses. A huge box of apples was donated by C’s Farms, cases of water bottles were from FitzGibbons Real Estate and one private donor. Oswego Bagel Shop provided bags and bags of bagels. FitzGibbons Real Estate also provided all the bagel fixings. The variety of chips was donated by Billy and Val Favata. Mike Nahorny took first place for the bike and Tom Richardson took the win for the run. Their prize was delicious homemade peanut brittle donated by Leighton Elementary teacher Natalie Canale. 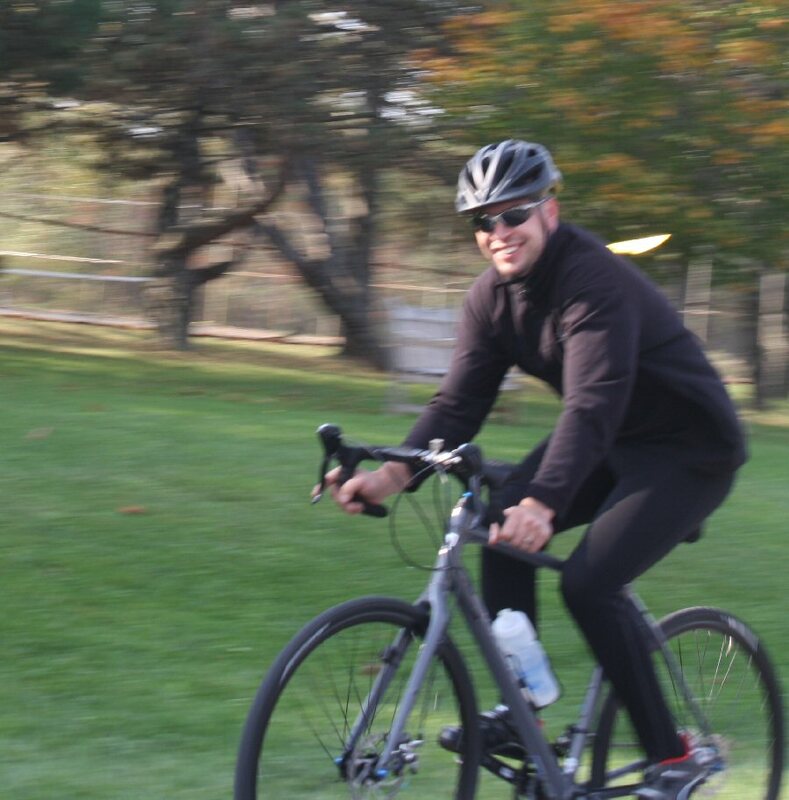 Mike Nahorney takes the win for the Oswego Tri-Sprint bike course. 50/50 raffles netted a nice sum and the winner, Cindy Tonkin, humbly donated back her winnings. Kelly Darling won the large Murdock’s gift bag of paper lanterns and other fun items. Ashley Lynn Wineries saw Heather Williams as the happy winner of that wine and gift basket. Kate Wells, Samantha Cleveland and Yvonne Brown of the committee Standing Strong For Cooper, started with the idea of raising $500 and having a bike-walk-run event with friends and family wearing T-shirts with Sharpies handwritten on them in a show of support of the the Levine family who has given so much to their community over the years. After the event was completed they raised more than they could have dreamed. With Cooper and his father, Alan, at the hospital, lovingly called, “Hotel Golisano,” Trish Levine humbly and appreciatively accepted the donation and outpouring of love from family, friends, businesses and community members that she knew and didn’t know. 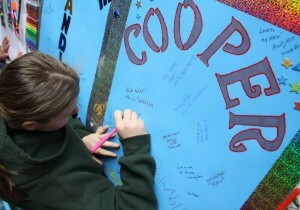 She said the word that Cooper continues to use is “overwhelmed” with the show of support he and his family has been given. The next benefit is a concert fundraiser being put on by Cooper’s family and friends at The American Foundry in Oswego. It will take place November 27, Thanksgiving Eve, from 6-11 p.m. The event will feature live music, food, music, and silent auctions. The tickets will be $10 and available soon for purchase at Raby’s Ace Home center, river’s end bookstore, Oswego Family YMCA, and The Clubhouse Tavern. Special thanks goes out to friends at Double J’s Printing, CRE8 Solutions, The Clubhouse Tavern, and The American Foundry for making this event happen. If you are interested in donating items for raffle or silent auction, please email Meghan Donabella at meghan[email protected] or Ali McGrath at [email protected] with details. Donabella and McGrath said, Thank you in advance for your support. To help support Cooper and his family, they will be raffling a stand-up jet ski. Tickets will be $20 a piece and 100% of the money raised will go to Cooper and his family. Tickets can be purchased through their facebook page via paypal, or by mailing a check. 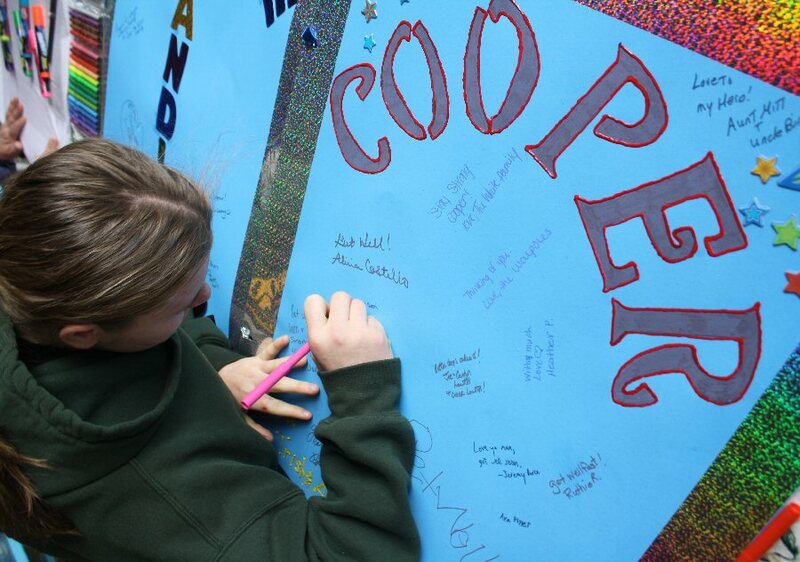 Let’s show our support for Cooper and come together for this great cause. This is a win-win situation; you will be donating to a good cause, while taking a chance to win a jet ski and try out one of Cooper’s favorite water sports. Please like them on facebook and share this to your family and friends, a small donation can go a long way. Please gift the money or include PP fees if necessary. The winner will be announced on November 26.